Here, at WireFlare, we are proud to support responsible commerce on the Internet – this is represented in our service offerings and unparalleled support. However, it has become apparent that the same environment that has helped this trend take off has also contributed to numerous cases of fraud and abuse of network resources. Spam is strictly against our Acceptable Usage Policy, and will result in the immediate disablement without refund of any customers who are found to have used spam in conjunction with their WireFlare account. Mailing list subscriber information must include the date and time that the subscription was confirmed, as well as the IP address of the subscriber at the time of the confirmation. The user must be able to present this information at WireFlare’s request. Lists procured from outside parties must have been consistently handled in a manner comparable to WireFlare policies. Users using either outside advertising companies or 3rd party mailing programs must abide by the same policies and practices as those using WireFlare’s own bulk mailing list tools. The user is advised and acknowledges that WireFlare’s electronic mail service equipment is located in California. In no event shall the user use WireFlare’s equipment in violation of California’s anti-spam laws including California Business & Professions Code sections 17538.4 and 17538.45. It is strictly prohibited in conjunction with your WireFlare account to sell software designed specifically to facilitate the practice of spamming. WireFlare reserves the right to disable any account at any time should it feel there is a reasonable suspicion that it is being used in conjunction with the practice of spamming. 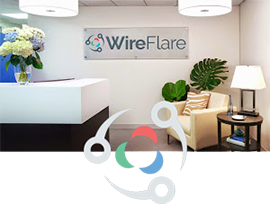 Customers must substantially address all spam related inquiries by WireFlare personnel within 72 hours. Failure to respond within a reasonable period of time may result in the disablement of the user’s account.